Very good news for Vivaldi Browser Users. The New Version of Vivaldi 1.2 470.11 had been finally released with some everlasting amazing feature. Vivaldi Developer released this version on 4th May 2016. This is a Snapshot version Update for Vivaldi Browser which means it is not a stable version and still under development. The version is available for Windows, Linux, and Mac. The New Version of Vivaldi Snapshot came across with new Custom Mouse Gesture Addition, which allows the user to create their own custom gesture and also allows edit existent Gesture from the list. Many more New Feature and bugfix can be seen in this new Update. How to Use this New Custom Gesture Feature? Well, its really simple Just follow below step and you can create your own gesture to perform on the surface of Vivaldi. 1) Click Vivaldi Icon on the top left corner. 2) Next goto Tools>> Setting. 3) In Vivaldi Setting Window goto >> Mouse. 4) You see many existing gestures. 5) Click + sign to add custom gesture >> select you command >> draw you gesture >> Your done. Note: It may found that Vivaldi Only allows Horizontal and vertical strokes and limit max upto five strokes, which may find a concern and hope to add Dynamic gesture strokes like Circle or other shapes. What More New Feature In Vivaldi 1.2 ? The Browser Address bar now also support Keyboard Shortcuts, which now allows opening new edited URL in the new tab using Alt+ Enter shortcut and in the background with Alt + Shift + Enter key Shortcut. Now Vivaldi developer added Never Save Passwords as a global setting in the browser. This Setting can be easily be disabled from Vivaldi setting >> Passwords (or search setting in search settings) >> and uncheck Save webpage passwords. Closing tabs order is now added as a Right or left order which is comfortable to close left side Tabs and right side tabs more easily. 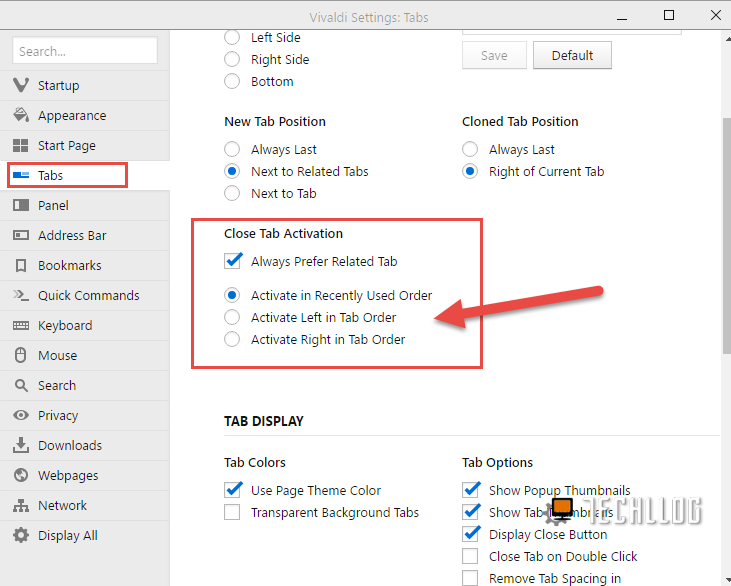 This setting can be change from Vivaldi setting >> tabs >> Close tabs. Dragging URL from Address field is now added. Drag Url and directly paste in Text field of the page. Webpage zooming range is extended – 20% to 500%. Very Simple Styling for Extension buttons is added. Google Keep extension login issue, else open an empty page on login. If the developer adds Alt+enter new tab feature to Search Bar as well it would be much better in navigating. History typed in the address bar is not in order with time or in ascending, selecting one pop that to the top of the list. When restoring to default in gestures settings then all the custom gesture are removed. It would be better if they add a save profile to it. Search Suggestion for Google and yahoo Won’t show up, this need to be fixed. Insert Note can be only seen in the Right panel. If they add an additional shortcut or option for it then that would be great.